Intepon,PM fiber components, WDM, Isolator, Circulator, Hybrid device, Module etc. The Polarization Insensitive Circulator is used for routing light path, widely used in sensoring communication system, features low insertion loss, high cross talk and high reliability and stability. Intepon mechanical optical switch is designed with leading performance in the industry, it features low Insertion loss, (typical ≤0.5dB, max≤0.8 dB) and compact size, (L)27.0×(W)12.6×(H)8.5, It's an ideal Component for OADM, OXC, system monitoring and error protection. It could be easy to integrate into a high density optical communication system. The VOA is built based on collimator with adjusting screw by hand which can easily attenuate the light in optical loop, it's widely used in optical testing and transmission system. The Faraday Rotation Mirror is built with All-glass technique sealed process, it performs wide working wavelength range so that fit for various wavelength, it can rotate the input signal polarization state for 90° or 180° after reflect back, widely used in sensor system. 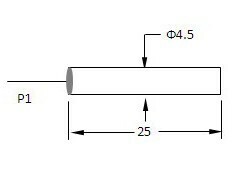 The Bandpass Filter device is built based on bandpass TFF(thin film filter), all-glass technique sealed process, it performs a very narrow pass working wavelength, but block both side, like shorter than 1040nm and longer than 1080nm.